I created a podcast, though, it is something I thought I would never do. I wasn't so hard on myself and just said, "Screw it! I'm going to see what happens." and pushed Publish. The first episode, One-Page Adventures, goes into some detail on why I created One-Page Adventures in the first place and a little 'how to guide' on One-Page Adventures. While highlighting my first One-Page Adventure, The Tower of Skulls. 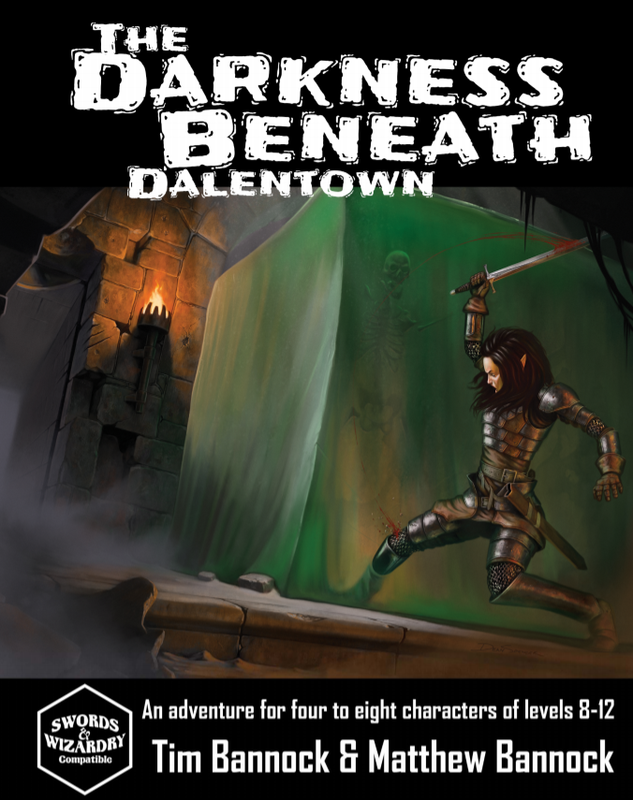 The Darkness Beneath Dalentown is a Swords & Wizardry adventure for characters of levels 8-12 by Tim Bannock and Matthew Bannock. First, I want to mention what pretty much everyone does with any printed module: Be lured in by the cover, read the back cover for more information and then flip through the pages before actually reading it. The cover is great! The title is legible so it doesn't use any crazy fonts that I've been seeing a lot of products using lately. Which, is a personal pet peeve of mine. If a product is sitting on a shelf at a store but I can't read the title because of the font then chances are I'm not going to look at it unless the cover is showing and the art draws me in. Also, on the cover it states clearly that this product is for Swords & Wizardry and that it is for four to eight characters of levels 8-12. This is something else I feel is extremely important for any module. Tell me how many characters and the level range of the module either on the cover or back cover. I don't want to have to flip through the book to find it. Now, the cover art. The artwork is by Dean Spencer. I love the style and I love the double take reaction I had with this piece. At first glance I saw an adventurer fighting off a gelatinous cube which tells me that I can expect to see at least one of these in the adventure. BUT then I noticed the blood on the sword and I thought, "Why would there be blood on the blade?" And then I realized that the adventurer is actually trying to hack away at (her?) own leg that is caught in the gelatinous cube. Very nice touch! Now there isn't a back cover because this is a PDF so I will just flip (digitally) through the pages to see what catches my eye. I noticed there are 6 maps and a few pieces of art that caught my eye. These pieces are on pages 1, 16 and 18. The artwork on page 16 has a female at an altar with a bowl filled with some sort of liquid. But what really caught my eye are the crazy figures behind her. They are creepy and disturbing in a great way. The interior artwork is by Dean Spencer, Patrick E. Pullen and Luigi Castellani. The layout and graphic elements are done by Elena Naylor. The adventure is 23 pages long including artwork and maps. There are also 7 pages worth of appendix information. 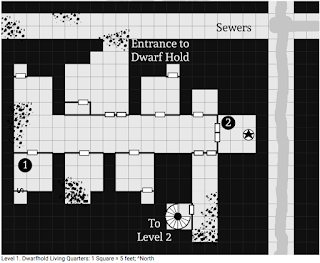 "...takes a party of adventurers below the surface of Dalentown to investigate a long-abandoned dwarven stronghold. But that's where the familiar tropes end! Spurred by stories of restless spirits, the party soon finds themselves staring down an invading force of oozes, slimes, puddings and jellies all in the service of demons!" First, I want to address one thing I already have a problem with in this chapter. It really isn't a real problem but it is mentioned twice: "Referees are encouraged to set this adventure in the sewers beneath a town in their campaign world to provide context and color appropriate to their games." The only reason why I have a problem with it is because even though the information on Dalentown is about a page and a half it still has a LOT of information on major locations/NPCs in the town. It highlights seven different locations and a total of sixteen NPCs. Half of the NPCs have their class/es and levels mentioned by their name. So I would use this town as where the adventure takes place rather than taking the adventure to another location. Though, you can do that with ease. There are four different adventure hooks listed including the traditional, "So, you're in a tavern..." hook. Also, there is an Events Table that is used to cause havoc within Dalentown. The events are to be used when the adventurers are either taking too much time in the town or when they go back up to rest and such. It is to give that feeling that if the adventurers don't act on what's going on below Dalentown then eventually there may not even be a Dalentown. I like that because it keeps the adventure going and so when things get slow, which can happen in any game, you can use the events to bring the players back into the game. The very first map within the adventure has about 15 rooms but only 2 of them is described and the final location (the last map in the adventure) has many, many rooms but only 10 of them are described. This might discourage some GMs who might need information on every single nook and cranny but for me this is perfect. It gives me a lot of room to make this module my own. And I also expect if I were a player in this module under three different GMs that I would have three different takes on this module. The monsters throughout this module are mainly oozes, slimes and jellys. Thus, they can be deadly encounters with things like immunities, acid, paralyses, magic resistances, etc. And where there are oozes you can also find....a lot more oozes. It's everywhere! The adventurers can't find a place that isn't crawling (or dripping, slithering, sliding, leaking) with oozes. And behind all of it is Jubilex, The Faceless Lord, and Sedeen, The Faceless Demon Ooze. There is one important thing the GM must keep in mind when running this module is that "Sedeen can experience what each of her ooze minions experiences and she can communicate through them." This can create unique and challenging encounters. 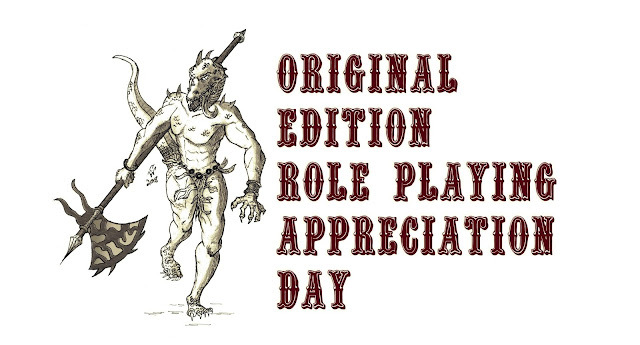 It can also create great moments in roleplaying. I would use this as my way of changing the playing field. For example, if the adventurers are doing much better than expected you can use her powers to change that. Maybe reveal, through an ooze, to the adventurers that one of the Events is taking place above them in Dalentown to make them choose: Help the town with the current problem or continue on. The Appendix A section gives details on the two magic items that can be found in this module and every monster the adventurers could encounter. So in reality if you are already familiar with Swords & Wizardry this is all that you would need to run the module. The Appendix B section gives rules and information on how to fill the bookshelves of the library (found in levels 2 & 3 of Chapter 2). There are 20 books/tomes/scrolls that could be found on the shelves using various tables. Some books are magical and can give bonuses, others are curses, others are just regular books (fiction, history, cookbooks, etc.) and there are also scrolls. Honestly, without playing it, I think the level suggestion might be a little too high. I believe if you were to have just the core classes at level 10 they aren't going to be struggling too much. BUT that is also why there are so many blanks on the maps. For you, the GM, to raise or lower the difficulty of the adventure by filling in the blanks. But I could see myself being able to run this adventure with ease. Often, I game with just a skeleton of an outline and make it up on the fly. And with this adventure having so many blanks and having just the key elements described I would have no problem running this after a single read through and jotting down notes. I think this is a GREAT example on how to write future modules! You don't have to describe every room/location. You don't even have to say empty or even number them all. Just write the story, the goals, the key elements, the stats and then let the GM create upon what you have given them. For $5 this is a great deal! I highly recommend this module and if the Bannocks continue with this model for their future Swords & Wizardry modules then I already know I'm going to love those as well! Now, to turn this into a One-Page Adventure for my on personal use. Though, I'm sure it would have to be at least three pages. Six-Shooters & Wagons may mechanically play very much like Swords & Wizardry Continual Light but outside of the mechanics it is a completely different style of gaming. Fantasy is more focused on PC personal gain while Western is more focused on community gain. In SSW your class determines what your character can do mechanically within the game rules but your profession determines who your character is within the world. What role does your character play within the Western game world? Your character's class may be the Gunslinger but their role in the town could be a number of things. Who's to say the Missionary isn't a Gunslinger? Or what about the Mayor of the town is a Vigilante? Just remember that the class helps define the mechanics but a profession helps defines the character. I love Swords & Wizardry and I love creating for S&W. It is just the right amount of simplicity and crunch that I want in a game. But I also love what other people have created and still continue to create using S&W. Personally, one of the greatest things to come out of Swords & Wizardry is Tenkar's Swords & Wizardry Light. It takes the core mechanics and turns it into a four-page folio that has everything you would need to run a game for characters level one to three. The success and ease of play and modification of Swords & Wizardry Light has spawned other amazing creations. And there is two that I really want to focus on: Light City and Six-Shooters & Wagons. Light City is a Super Hero hack for Swords & Wizardry Light. It is being created by Jonathan Linneman of Monstrous Matters with the help from Justin Ryan Isaac of Halls of the Nephilim. Unfortunately, there really isn't a complete collected works. The above link has everything that is currently created for Light City. Some of them are just articles while others have links to them on OneBookShelf. But there is one product that I feel is the MUST HAVE if you want to start playing Light City: The Assembly. Just like Swords & Wizardry Light it has all that you would need to start running your first adventures* (I'm sure there is a better word for that) as Super Heroes. It has 3 classes, items and adversaries all on two pages. Also, it mentions that you can use Swords & Wizardry Light with this product (races, classes, items, monsters, etc.) Later, I will eventually make a post and/or file on how to add flavor to Swords & Wizardry Light to make it fit in a game of Light City. Six-Shooters & Wagons is a Western, Wild West hack for Swords & Wizardry Continual Light created by Justin Ryan Isaac. For more information I wrote a review that can be found here. The reason why I am focusing on these products is because I want to see them grow into something larger. I plan on creating some One-Page Adventures designed for these products. Though, they don't follow the typical fantasy structure of adventures. And that is one of the things I want to focus on: A 'how to' create adventures and run these systems kind of thing. When I read through these two products I view the gameplay style/structure completely different from Swords & Wizardry. I did something this morning. I woke up and while I was having my morning coffee I realized that there was still time for me to contribute to Original Edition Role Playing Appreciation Day. And so I made a brand new One-Page Adventure! Though, it isn't in the same style/format as my other ones since I just didn't have the time to work on it. To Hunt a Dragon a One-Page Adventure for Swords & Wizardry Light. A town/village has been dealing with some attacks on their farms by a group of Lizardmen and a Wyvern. The adventurers must hunt down these Lizardmen and the dragon beast through a treacherous swamp. This is a dangerous task that requires only the best of the best adventurers!